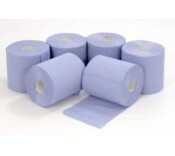 This centrefeed paper roll dispenser is for use Blue Centre Feed Hand Towels 2-Ply 150m Rolls w..
White 2-ply toilet roll 200 sheets per roll 36 rolls per pack ..
White 2-ply mini jumbo toilet roll 150m per roll 12 Rolls per pack ..
White 2-ply jumbo toilet roll. 400m per roll 6 Rolls per pack .. The Tork Mid-size Toilet Roll system will make sure that you never need to run out of paper. It is s..
Blue Centre Feed Hand Towels 2-Ply 150m Rolls Case of 6 Rolls ..
Blue Wiping Roll 2-Ply 400m roll Case 2 rolls..
1 Ply c-fold green hand towels 220mm x 305mm sheet 2624 sheets per box..
Easy to clean, this paper towel dispenser is one our most popular dispensers suitable for commercial..
General purpose industrial wiping rags 10kg Pack ..
White cleaning rags for commercial and industrial use. Bleached rags are suitable for a variety.. Ideal for general wiping for office kitchen and domestic use. 2-ply, 45 sheets per roll 24 Ro..
36 Packs x 250 Toilet Tissue Sheets = 9000 Toilet Tissue Sheets ..